Highfield is registered to provide round the clock nursing care, to people with often very complex needs, by highly qualified and experienced team of nurses and care practitioners. Providing residential, respite and day care services for adults of all ages who require professional nursing care. Highfield is also ideal for those who require a period of convalescence or a short break in a supported caring environment. We promote independence with the emphasis on rehabilitation and have our own physiotherapy department. Our aim at all times is to tailor our care to enhance an individual’s quality of life within friendly, clean, safe, comfortable and attractive surroundings and with therapies and activities that enrich life. There is a wide range of delicious home cooked meals and the spacious rooms and suites are designed to the highest possible standards. The tranquil setting and landscaped gardens are surrounded by open countryside, yet are close to Wrexham town centre and all its amenities. 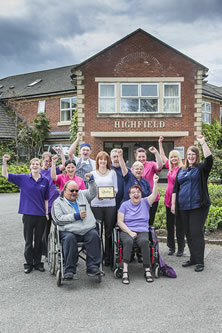 Highfield was the first Care Home in Wales to achieve a ground-breaking accreditation from the Gold Standards Framework. The programme helps improve quality of care provided from the day a person arrives to the end of their life. There is a focus on reducing unnecessary hospital admissions and putting the residents' needs and preferences at the forefront.